The King James Version Compact Wide-Margin Bible uses the popular Boldtext type for readability in a convenient compact format with ultra-wide margins for the reader's own personal notes. This Bible provides tremendous portability for bringing to church, traveling, and for personal study. 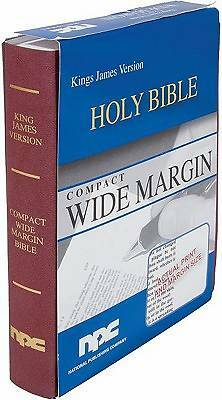 The King James Version Compact Wide-Margin Bible also includes one of the most trusted and accurate Bible translations in the King James Version. Nowhere else can you find this combination of beautifully written Scripture, bold type for readability, functional compact size, wide margins for note-taking, and affordability.